Since I began writing this blog, I have followed a few others. The ones I read often are listed on my profile page. 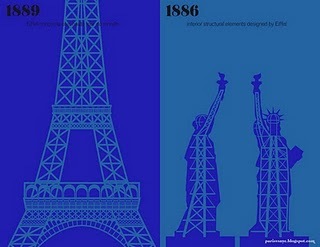 A new one called Paris Versus New York, a tally of two cities came to my attention today (thank you, God, I Love Paris). It's obvious what's going on here. The graphics are clever, as are the concepts and cultural difference that are being visually compared. It's just a bit of fun, for a lover of both cities. In this contest, there are no losers, only two winners, though what would we do if we couldn't compare and contrast, brag and whine?